Women's Original Tall Rain Boots is rated 4.3 out of 5 by 178. Perfect for wet weather conditions, this women's Rain Boot has been at the heart of the Hunter Original brand since its introduction in 1956. Formed of natural rubber, each pair is made from 28 hand-cut parts and assembled over three days on an aluminium last bespoke to Hunter, before being vulcanized for superior protection. 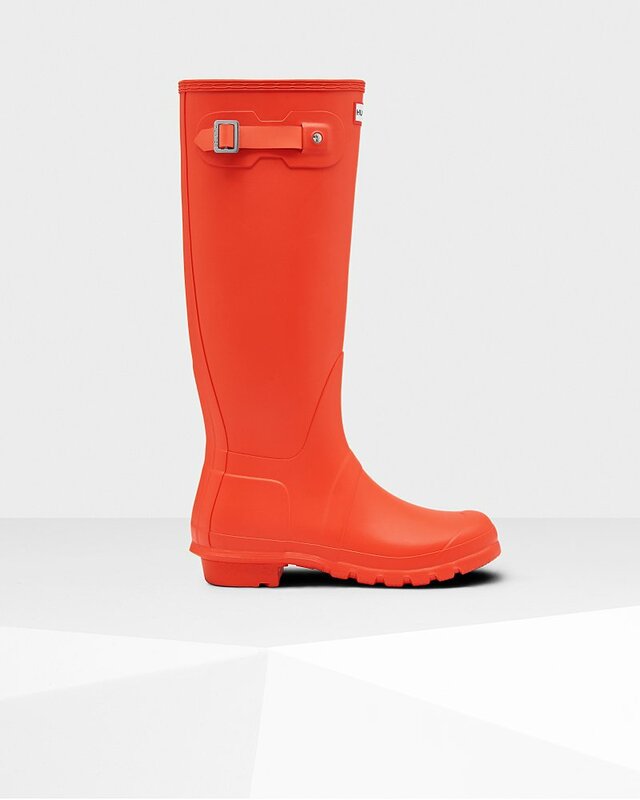 Featuring the Hunter Original tread pattern, and a comfortable polyester lining, the Original Tall in fiery orange is a timeless wet weather staple. Rated 5 out of 5 by Mimi22 from Love it I was not sure to purchase it but I have no regrets i realy love it!! Rated 5 out of 5 by Kary19 from Very comfortable I love my new boots. They are very comfortable, right from the beginning I was able to wear them for long period of time. The extra height makes them great for using at the waterfront, getting in and out of the boat, etc. I purchased these on sale so got a great deal and like them so much I purchase another pair for my daughter. Rated 1 out of 5 by not appropriate from Very disappointing I have been wearing genuine Hunter boots for over 20 years. When I bought these to replace my old ones I could not believe the poor quality, pinched fit and shoddy workmanship. So disappointed. Rated 5 out of 5 by Cyndie123 from Love love love I bought my boots a few weeks ago! The quality is absolutely amazing! I contacted customer service for questions and they were absolutely great! More Hunter products are in my future purchases for sure!! Rated 4 out of 5 by Keri from Cute boots I bought the boots about a month ago, but they fit so large that I haven't been able to decide if I'm just not wearing thick enough socks or I need to return them for a smaller size. Being so busy and having to do my shopping online, I haven't had the chance to find a store to try on a 7.5 to know for sure, so the boots are sadly just sitting in the box by my front door :( Hopefully one day I'll get to wear em! Rated 4 out of 5 by Lilyw from Great boots These boots are great, they fit my feet fine, however I should have ordered a wide calf as they are a bit too tight to be worn with jeans on my legs. Other than that, great product! Super waterproof, good for all types of weather. Rated 3 out of 5 by Ash94 from Love my hunter boots I bought them this time last year and I love them and wear them often because they are super comfy. However, I have noticed that the soul of the boot has little wholes so water collects in them and make noise when I walk which drives me crazy. For the price I thought they would have lasted longer.